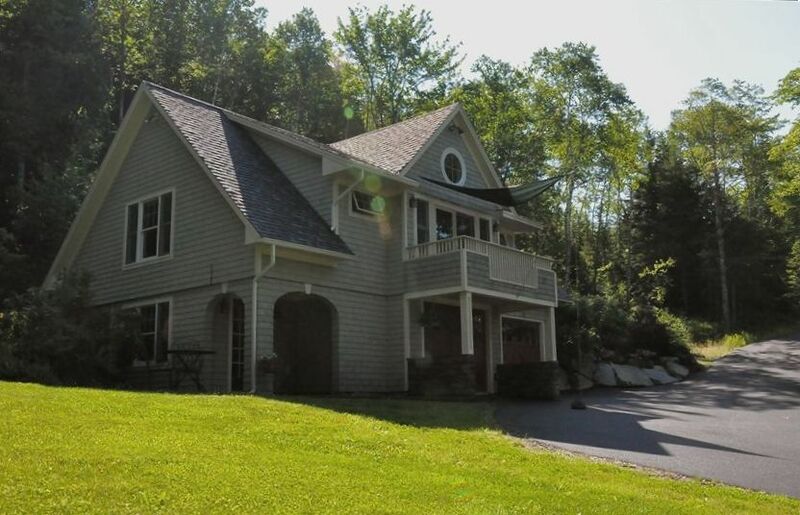 Our Carriage House is located on a beautiful stretch of Maine's mid-coast area. Conveniently located between the two towns of Belfast and Camden, the house is set in a very private area, at the end of a mile-long paved, private cul-de-sac drive. Nestled into a wooded ridge at the top of Jackson Hill, the Carriage House is an ideal vacation home for a family or a couple looking for peaceful, upscale lodgings while exploring coastal Maine. The house was built in the spring of 2004. It is the sister building of a larger home (not visible from the Carriage House) and both houses share the same driveway. The house features all new appliances. The master bedroom has a queen bed and a twin in a cozy alcove separated by a curtain. An adjoining bathroom has two locking doors, while the second bedroom has two twins. There are three outside decks. A small shaded balcony off the kitchen offers a lovely place to have enjoy morning coffee while viewing the beautiful wooded surroundings, mountains, and distant ocean. The front patio has a table and chairs and is good for enjoying the woodland scenery, relaxing or sunbathing. The back patio is the perfect place for outside grilling, sunning, or reading. We live on the coast of Maine with our 3 young children. I am a local pediatrician and enjoy sailing and playing soccer during my time off. We bought the house and the land that it was built on in 2004. We lived here for 2 and a half years while we planned and built the house that we currently live in, 700 feet up the hill. We think that the Carriage House is a perfect spot to stay for anyone who is interested in seeing mid-coast Maine. We love the fact that the house is completely private: nestled in the side of a hill, surrounded by beautiful woods, and the Camden Hills and Penobscot Bay in the distance. When we travel, we also appreciate clean, well appointed facilities. We have done our best to make the accommodations in the Carriage House those that we would hope to find when traveling. Woodland tranquility is the best feature of the Carriage House, which is something that seems to be harder and harder to find. Sitting on one of the three decks enjoying a coffee, you might see turkeys wander by, or hear the cry of a loon from a nearby lake. We have even seen a moose in the yard! At the same time, it is within range of numerous fun activities like beach swimming and boating, windjammer cruises, good restaurants, Acadia National Park and many others. Come and see for yourself! toilet, combination tub/shower, Tiled floor with designer faucet and generous showerhead. Tiled floor with designer faucet, mirror, and generous showerhead. Sliding glass shower door. The house is in the Cole Creek valley which leads right to the ocean. Public beaches are a few mile drive up the road. Northport is a quiet town in rural Maine. There are no stoplights or malls. We face Penobscot Bay and enjoy marine activities like boating, fishing, and watching the schooners. Lincolnville Beach is a few mile drive up the road, with public beaches, galleries, restaurants, a bar and the Islesboro Ferry Terminal. The Camden Hills are easily visible as well. The home is tucked into the base of Jackson Hill, a short steep hike up the backyard. Many guests enjoy walks in the woods in our quiet neighborhood. A limited view of Penobscot Bay can be seen from the balcony. The home has no land-line, but 4G Verizon cell network access is good. New Energy Star a/c 2013. It is rarely needed in Maine. Reliable oil furnace and hot water heat, regularly maintained. High-quality linens including beach towels. On a beautiful masonry pedestal sits a faux woodstove which provides cozy ambiance and heat without the mess and hassle of logs. Dedicated parking area 20' from home, accommodating up to 3 cars. WiFi is up and running on a G network. We usually get 5Mbp/s download and 2Mbp/s upload speeds. 4G Verizon network access is also good. The house is located at the end of a mile long paved private road. Living area features a sitting area and a 42" 1080p plasma smart TV. Netflix, Youtube and Hulu are available with your account. Few over the air stations are available, but a DVD player is in use. Refrigerator/freezer with ice maker. Water filter pitcher included. Gas range with simmer and high-heat modes. Drip coffee maker with coffee bean grinder. Beautiful eat-in kitchen with cathedral ceiling, fan, sliding doors opening onto newly renovated deck with custom shade. Wine fridge and biamplified stereo system with headphone audio input. Eat-in kitchen with 4 seats, table fits leaf which could seat 6 with woodland view out of sliding glass doors. 42" 1080p plasma smart TV for 2013. Few over the air stations are available, but a DVD player and a variety of discs are present. Movies and TV shows are available via Netflix and HULU. Biamplified Sony stereo system with AM/FM Stereo radio and audio input cord for your iPod, cell phone or other music player. A shelf of novels is available for your reading pleasure. Several puzzles and games are available for use. A small lawn and professional landscaping featuring rugosa roses, iris set off the stone walls and birch/pine forest. Lady slippers bloom in June. Balcony outside kitchen is a lovely spot to enjoy breakfast on the bistro table while watching the sun light up the valley. Rental available at nearby shop: Maine Sport. Bicycles of various sizes may be available for use. Please ask owner if interested. Enamel red gas grill with built-in thermometer, side burner and cover on back deck. Deck outside front door is tiled and has its own table and chairs. Back deck has the gas grill. Balcony has the breakfast/cocktail seating area. Belfast City Park has public Tennis courts. Quite! Beautiful views! Everything you need! Great location for us to stay, near family! Got to see the peak of the trees ! We enjoyed the Carriage House for the month of Oct. and could have stayed longer. The cottage is tucked into the hillside with lovely natural landscaping. Each time we drove up the road from the highway, we felt that we were returning home. The inside of the cottage is sunny, tastefully decorated, and very comfortable. The upstairs kitchen and dining room have a great view. Our favorite activities were hiking, beachcombing, and prowling around Camden. We'd recommend this cottage to anyone who likes privacy and a natural setting. Beautiful cottage nestled in a woodland setting in mid coast Maine. My husband and I spent 2 1/2 months there and we had a wonderful time! The house is very comfortable and nicely decorated. Located right in between Belfast and Camden, two quaint and amazingly beautiful towns. Joe, the owner is very nice and accommodating. Always available when needed. We had great weather, saw the leaves change color....and we also got to see some snow! If you're looking for a place to stay while exploring the coast of Maine, this is definitely the place! We'll go back to Northport one day, and hopefully the cottage will be available. House is private, in a quiet spot, nearly new inside, well-maintained, has great light, and was nicely appointed. Gas stove and decent cooking gear a real plus. Nice variety of decks & spaces. OK wireless. Great location for general mid-coast Maine activities. Near oodles of kayaking & hiking, not even counting the ocean. We are pretty low-maintenance so didn't ask much from owners, but they seemed very nice. Minor negatives: no dressers/bureaus for clothes in Master Bedroom. Bed not the greatest - too squishy & had troughs. We had the perfect holiday and your lovely carriage house couldn't have suited us better. The house was clean, quiet, comfortable, and spacious. Also, it was a great value. The owners are lovely people and aim to please. We hope to return next year. Wonderful retreat in Northport, ME! We just returned from a four-night stay at the Carriage House. Per the listing and reviews below, there is no cable or internet, but we didn't need it! At first we were concerned at how we would "survive" but after one day without we realized how truely relaxing it is to not have these things we have come to rely on. A real vacation for us away from the hussle of everyday life. We did rent DVDs from the Redbox located at the Hannaford in Camden, about a 10 minute drive south on Rt. 1, and remarked at how nice is was to watch movies - something we don't do often. The Carriage House itself was clean and very comfortable. Ceiling fans in all the rooms circulate the fresh Maine air very efficiently and keep the house cool. We have an infant daughter so we set up her pack and play in the second bedroom which was great - the blinds in this room are even babyproofed without a cord! The location is superb for Camden, Rockland, Rockport and Belfast. We also took a day trip up to Acadia and Bar Harbor, which took us under 2 hours. Beth and Joe are excellent hosts, and were very attentive to our needs. We highly recommend staying here for a relaxing vacation where you are able to completely unwind and enjoy the coast of Maine. Near to the Islesboro Ferry in Lincolnville for day trips to Islesboro. Also near the Camden Hills State Park. To our north, in Searsport, antique enthusiasts can find popular open air markets. Camden boasts lots of activities for visitors including schooner trips, shopping, hiking, and lots of great restaurants. If you come in August, be sure not to miss the Lobster Festival in Rockland as well as the Maine Boats, Homes, and Harbor Show. Cancellation policy: If a traveler cancels up to 60 days before their stay, they are given a 100% refund and are not charged any booking fees. For the bookings cancelled up to 30 days in advance, the traveler receives a 50% refund.